The first band to hit the Main Stage this year was Portland, ME standouts This Way. The vintage Americana group has been friends of KahBang for some time and never fail to bring the place alive. The revivalist, wandering lyrics and vocal delivery reminded us a bit of Willie Nelson, which is never a bad thing. Flushed out by great banjo playing and strong female vocals, the band set the tone for the rest of the evening. Following This Way was another local favorite, The Mallett Brothers Band. The Stetson-adorned, country-folk group were a nice mix between Old Crow Medicine Show and The Avett Brothers. They had a total of 4 guitars on stage, and all of them, from acoustic to slide could play. Late Cambrian played an impossibly catchy set over on the 2nd stage. Their music was power pop à la Mathew Sweet or Ozma. The energetic group could churn out a synthpop ditty as well as a disco-punk song one after another. They had a song called “Ryan Gosling,” and at one point, they played a snippet of “Blackbird,” which was pretty cool. Lady Lamb The Beekeeper finished off the 2nd stage with a bang. Backed by The Milkman’s Union, she performed one of the most blistering sets of the festival. Aly, a.k.a. 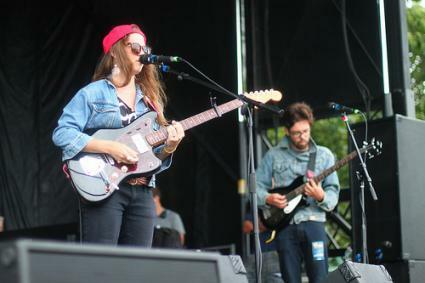 Lady Lamb, makes manic, angular indie rock that perfectly compliments her powerful voice. She may have had a small, unassuming stature, but their sound was huge. She would chirp and then scream through her paranoid, asymmetrical tracks, leaving the listener to just sit back and admire. Her set was wayyyyy too short, but she finished it with an amazing rap that made mince meet of Missy. She has a new album that is already recorded and just waiting for a release date, so make sure to keep an eye out for that. Check out a bunch more PHOTOS from KahBang right HERE. - Adam G.